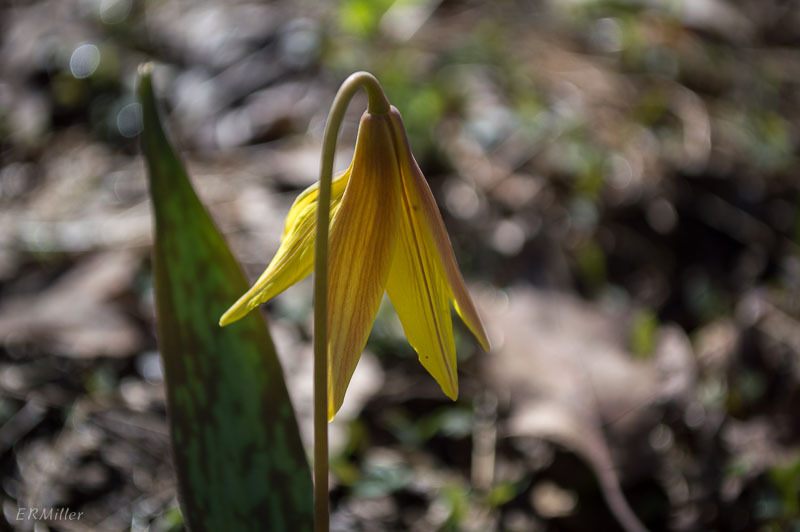 Both of these species are known by the common names trout lily, fawn lily, adder’s tongue, and dogtooth violet, with or without the adjectives “white” or “yellow” in front. (Think I’ll just stay with Erythronium.) 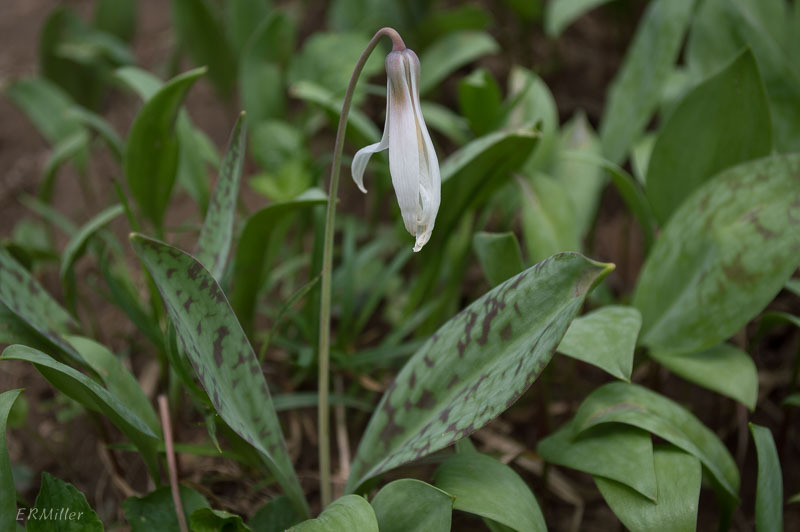 The names trout lily and fawn lily come from the speckles on the leaves. The name dog-tooth violet comes from a similar species native to Europe (E. dens-canis), whose bulb is said to resemble a dog’s tooth. I have no idea if adders have speckles on their tongues, nor am I going to conduct field research to find out. Like so many other flowering plants at this time of year, the Erythroniums are spring ephemerals found in moist, rich woods. They grow in colonies by the hundreds, but only a few plants in a patch will flower in any year. I’ve read that it takes 3 to 4 years, or up to 7 years, for a plant to reach maturity and flower. E. albidum can be found over most of the eastern part of the country (not in New England or some of the southern states), and is said to be more common in some areas than E. americanum is. It’s threatened in Maryland. E. americanum can be found almost everywhere east of the Great Plains (except Florida), and is threatened in Iowa. A third species, E. umbilicatum, can be found in Maryland, but I’ve never seen it. 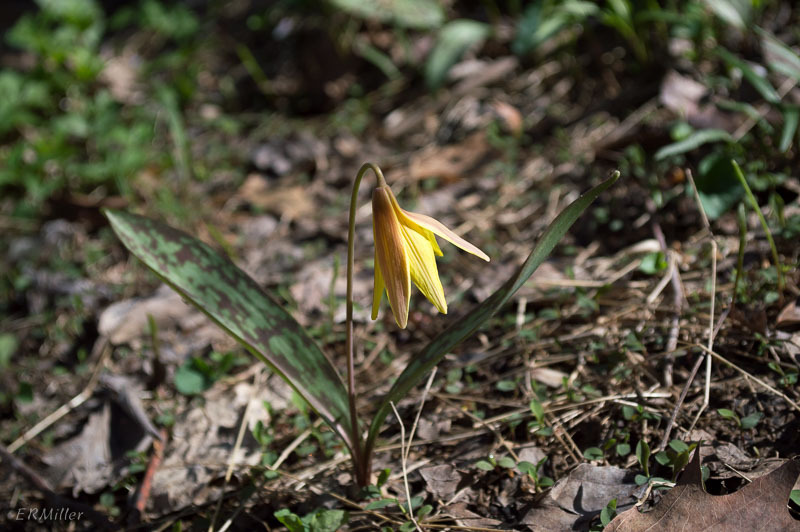 Twenty one more species of Erythronium (all natives) are found in the midlands or west coast. 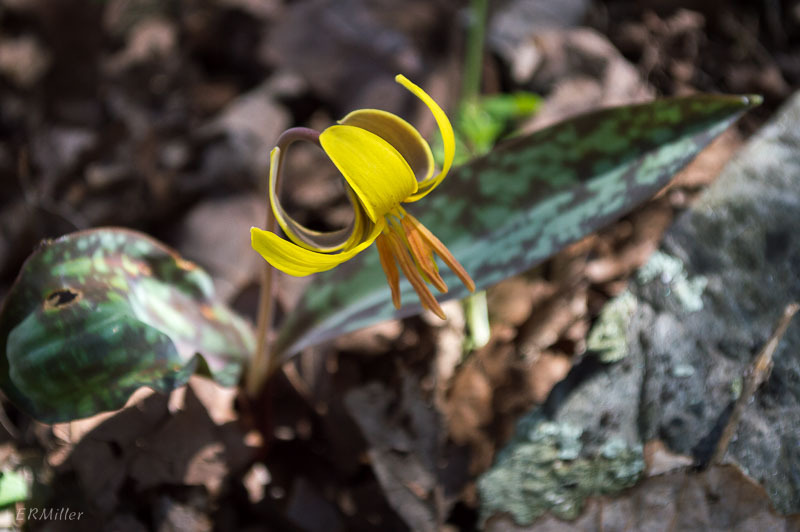 This entry was posted in Uncategorized and tagged adder's tongue, dog-tooth violet, Erythronium, fawn lily, Liliaceae, trout lily by elizabeth. Bookmark the permalink.